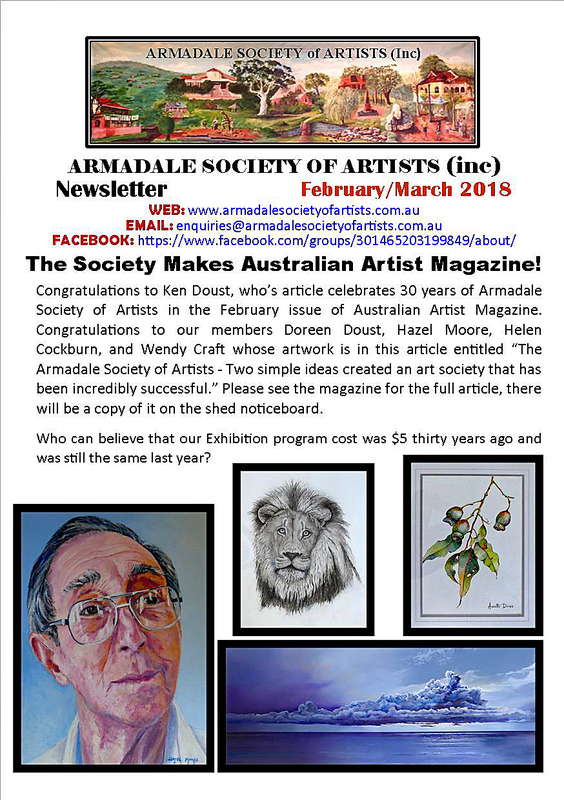 Hello again everyone, here is the February newsletter, we hope you enjoy reading all about what we have been doing and what is coming up. HAZEL MOORE now has some lovely artwork on the site, she will aslo take commissions and specialises in portraiture. clisk HERE to enjoy her work. 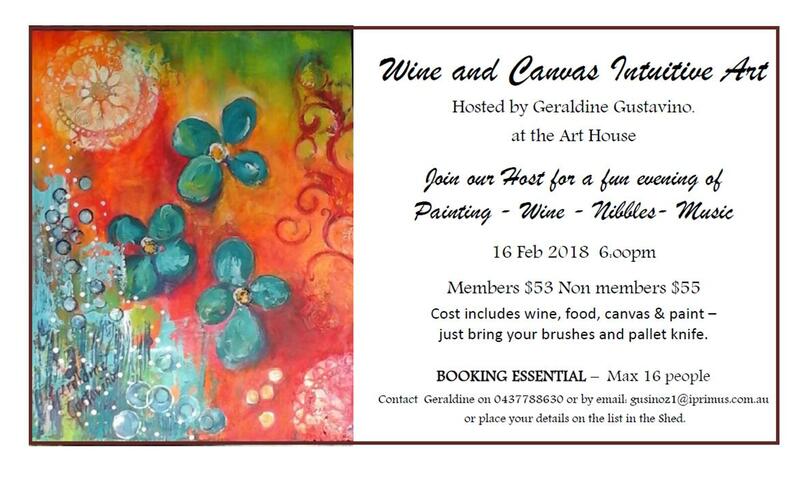 $60 Cost includes wine, nibbles, canvas & paint – just bring your brushes and pallet knife. 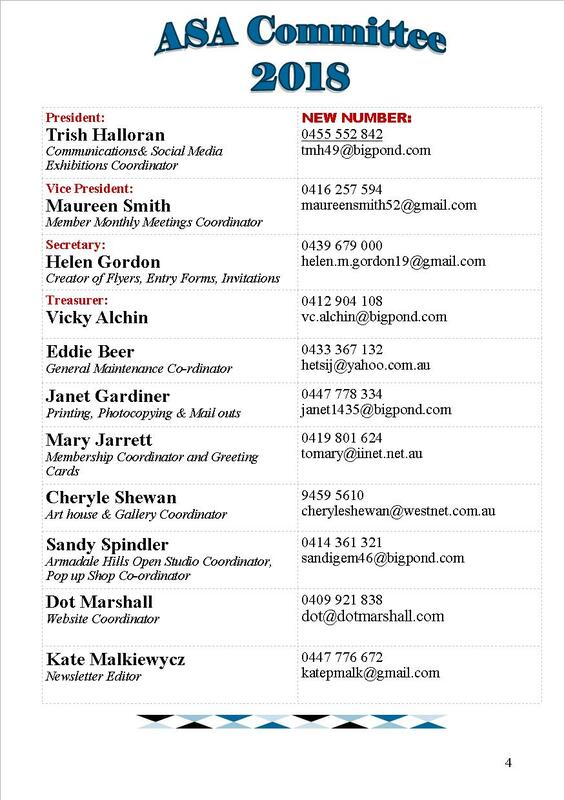 BOOKING ESSENTIAL – Max 16 people Contact Geraldine on 0437788630 or by email: [email protected] or place your details on the list in the Shed. 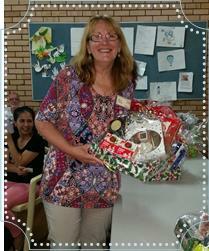 Congratulations to all of our raffle winners drawn during the counting of the votes; Ian Kallas, Eddie Beer, Dot Marshall, Karen Bayley, Gary Sayers, Val Mezger, Peta Gallagher, Anna Newbey (twice), Libby Morrah, Peter Risk, Frankie Maher, Jane Trichet, Lucia Dulin, Helen Cockburn (twice). Photos courtesy of Josephine Titshall. 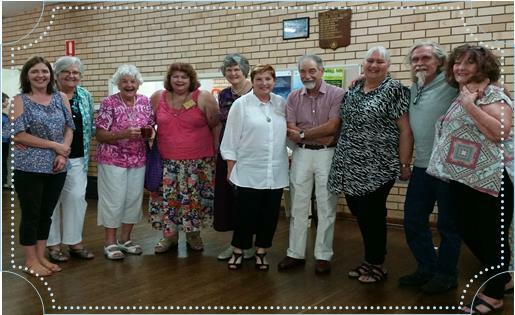 L to R: Vicki, Alchin, Mary Jarrett, Janet Gardiner, Maureen Smith, Helen Gordon, Trish Halloran, Peter Risk (Patron), Cheryle Shewan, Eddie Beer and Sandie Spindler. I am delighted to be writing my first President’s foreword for 2018. I want to personally thank the Members who attended our December AGM and cast your votes for the 2018 Committee. We had our first Committee Meeting on the 16 January and we are well prepared for the year ahead. Inside this first edition is a new listing of all our Committee and the Portfolios they are Coordinating. 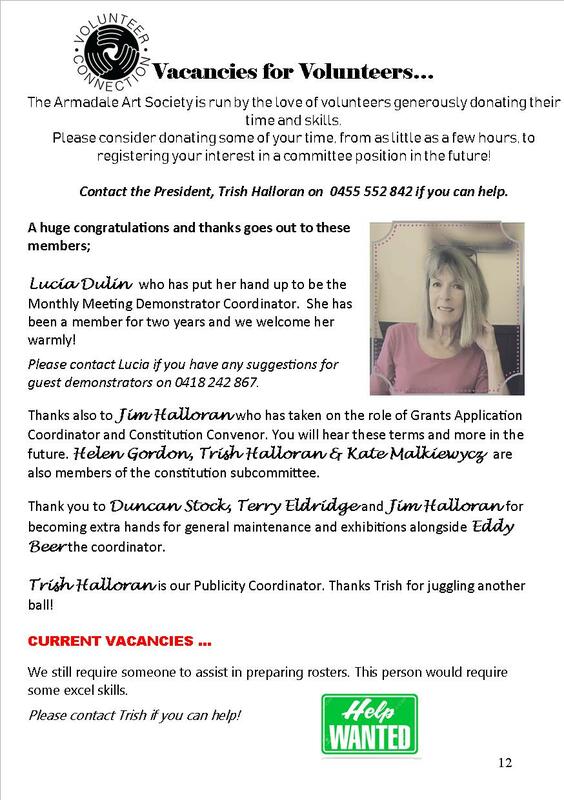 Hopefully this will make it easier for you our Members should you have an enquiry and wish to talk to a Committee Member on a specific matter. I plan to be at the Art House on Friday’s between 10 and 12 noon and I am inviting you to pop in should you have an issue you wish to discuss. Our February Members Meeting is on 01 February at Creyk Park and hopefully we will be welcoming quite a few new Members to the meeting. Members entry is free. You are welcome to bring a visitor along, first time is Complimentary. 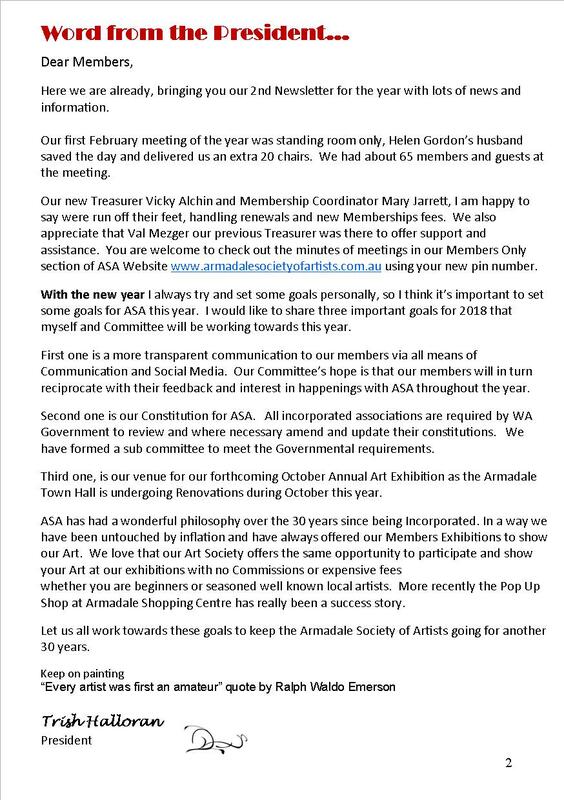 Our 2018 Membership’s are now due for renewal, new member forms have been included in this Newsletter, please complete and bring along with your fees to the next Members Meeting, or alternatively post to the Treasurer’s address on the Membership Form. The ASA web site is looking excellent and it is well worth browsing our site. You will find a members only section which can be accessed by password and Pin Number, which you will receive with your renewal Membership card and other discount cards. The new members only section will give you access to download Forms, Roster information, Minutes of Meetings. The Pop-Up-Shop at Armadale Shopping Centre leading up to Christmas sold over 100 paintings which was a fantastic thrill for all concerned. I would like to thank the Sub Committee, and the Hanging Team for all their hard work. 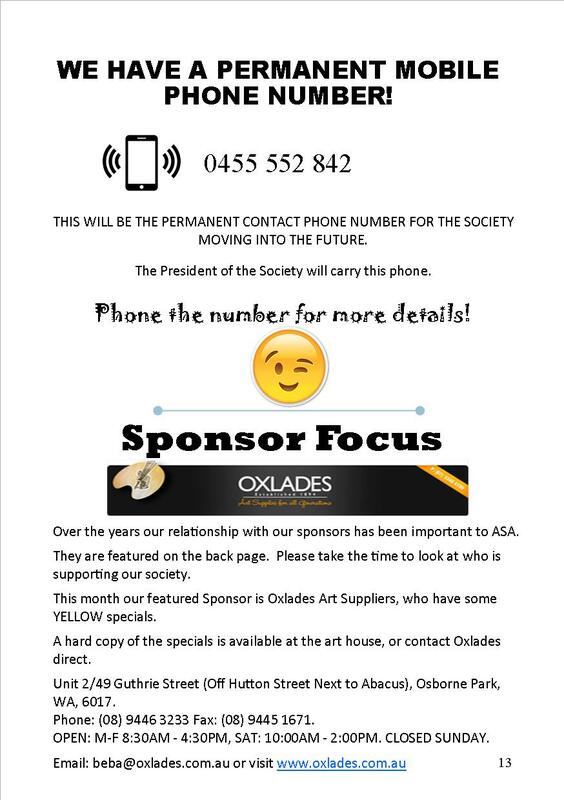 Having that access to the General Public has given us the unique opportunity to Promote ASA to the Community. 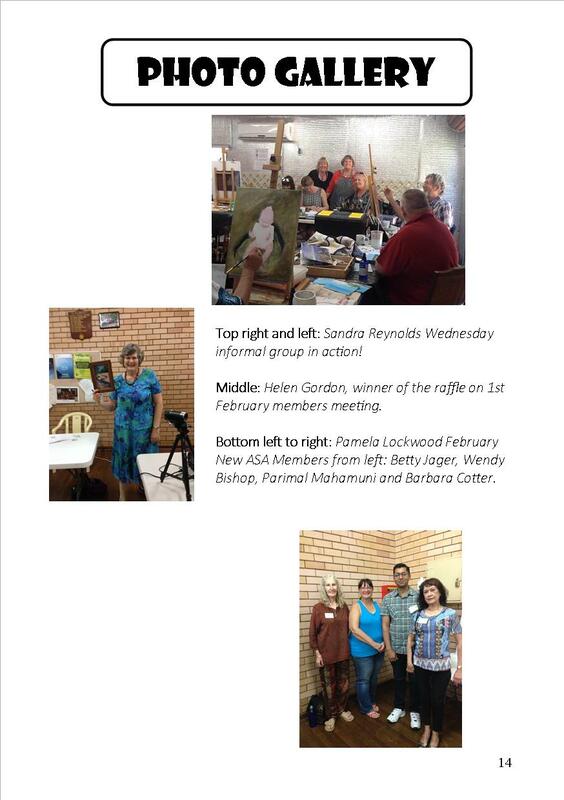 Other local artists have popped into the shop for a chat and lots of Membership information has been circulated. Current status on the shop. It looks like we may have the Pop-Up-Shop for a few months longer so please check out inside the Newsletter for the Pop-Up-Shop News. I am feeling very excited that this is shaping up to be a year full of activities. We have a wonderful Committee and Volunteer infrastructure which hopefully is now more accessible to all our Members. 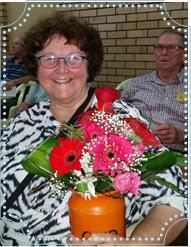 I would also like to congratulate and welcome our Newsletter Editor, Kate Malkiewycz on her first newsletter. Creyk Park Pavilion, Waltham Road, Armadale. 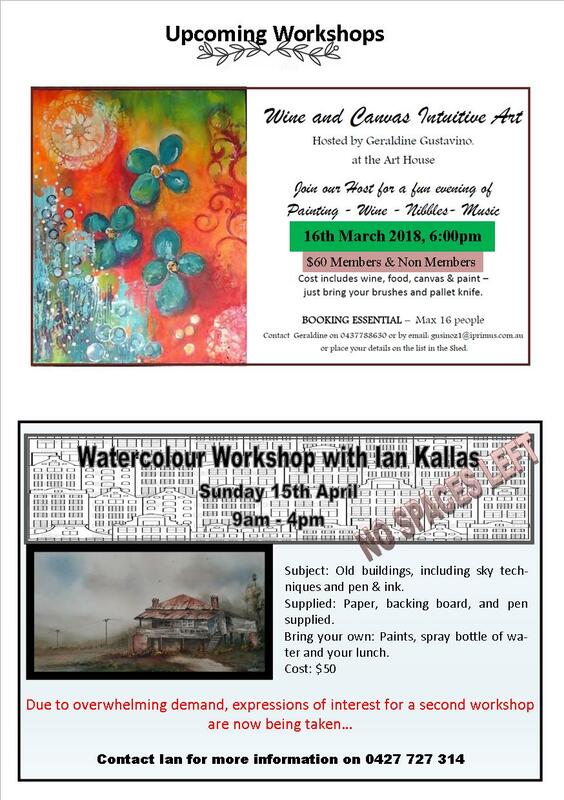 We are excited to be welcoming Pamela Lockwood as the Demonstrator at this meeting to demonstrate flowers in watercolours. Pamela considers herself a traditional watercolour artist, and also paints abstracts using acrylics. 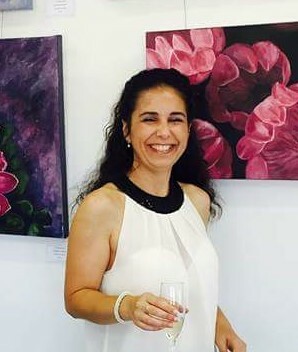 She has also won many awards for her paintings in both watercolour and acrylic, and teaches watercolour techniques at the Atwell Gallery & Karen Frankel Art Studio. The Loose and Luscious Ladies will also be continuing to delight our tastebuds by providing supper. Deliver paintings Monday 19th or Tuesday 20th February. Remember to fill out cards for your paintings. 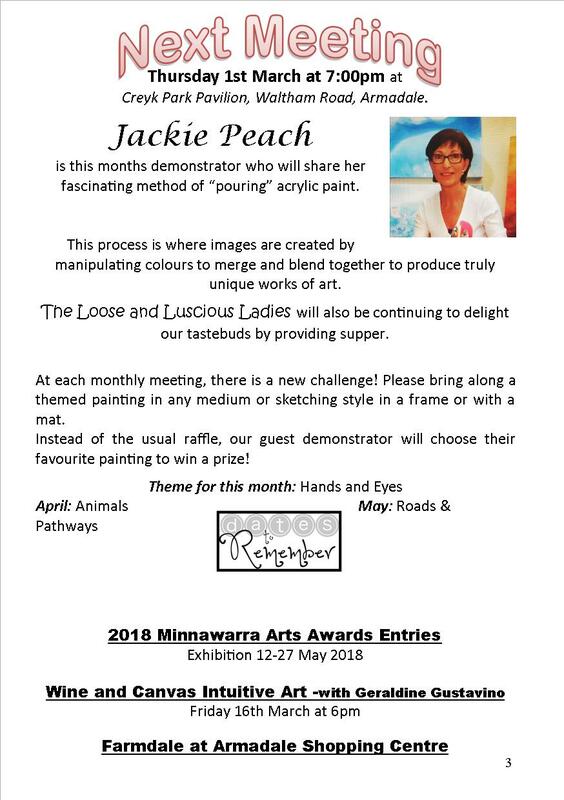 Entries open early February, exhibition 12-27 May 2018. Call in and see the resident artists Sandy Robertson and David Box, as well as the feature artist of the month. You are always welcome to sit around the table with a cuppa for a chat! Feature artist to be advised... 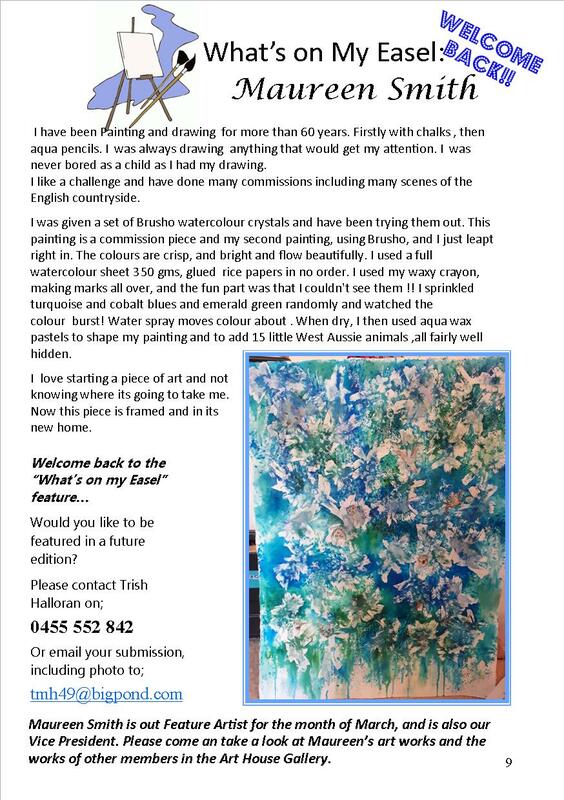 Contact Cheryle Shewan on 9459 5610 if you have an interest in being the feature artist in future. Open: Friday & Saturday, 10am—3pm and during classes. Solar painting is an interesting technique using inks or fluid watercolour, dropped on paper and put out in the sun for it to do it’s magic! We will use ferns, leaves and flowers to create patterns. As in the above painting (triptych) the painting worked without any additions to it, but you can use it for many things. As a background for a painting, use it as a collage paper. It is limited by your imagination. 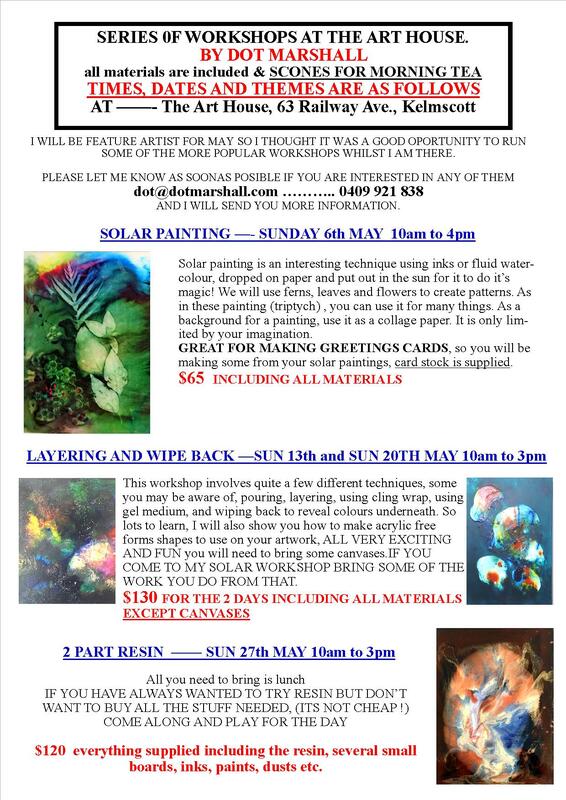 GREAT FOR MAKING GREETING CARDS, so you will be making some from your solar paintings, card stock is supplied. For further information, please don’t hesitate to contact me by email or mobile phone. 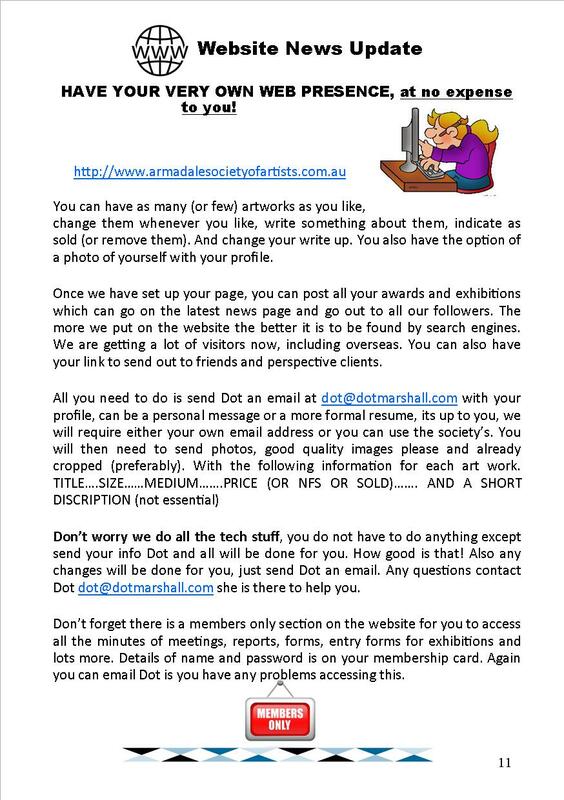 I hope you will have a very exciting time at our workshop, remember that your art should be primarily for your enjoyment, if someone else loves it enough to have it on their wall, that is a bonus. If you love what you do it will show in your work. Subject: Old buildings, including sky techniques and pen & ink. Supplied: Paper, backing board, and pen supplied. Bring your own: Paints, spray bottle of water and your lunch. 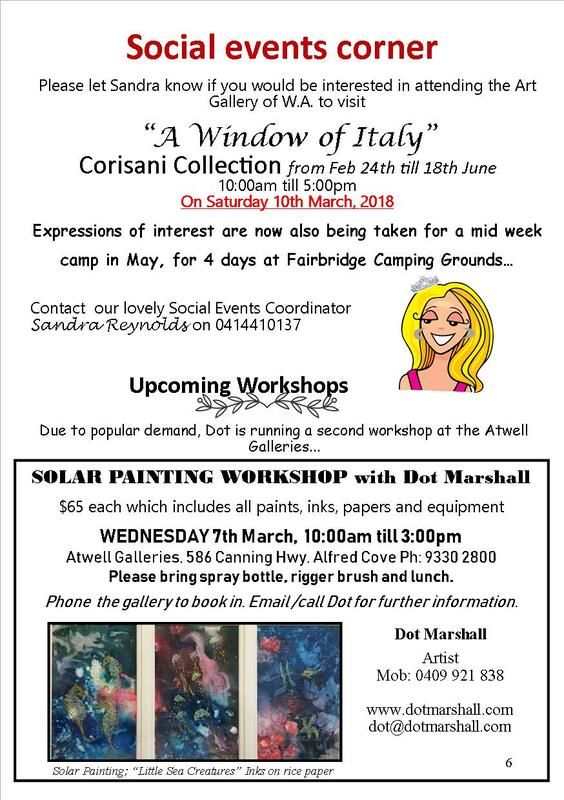 We have just invited another 5 artists into the Armadale Shopping Centre Pop-up Shop which completes our wait list to date. If any participating artists are considering withdrawing, please let us know asap as rosters need to be worked out. 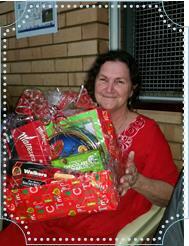 We do have a sub committee for the shop for any queries, Sandra Spindler, Valerie Mezger and Maureen Smith. 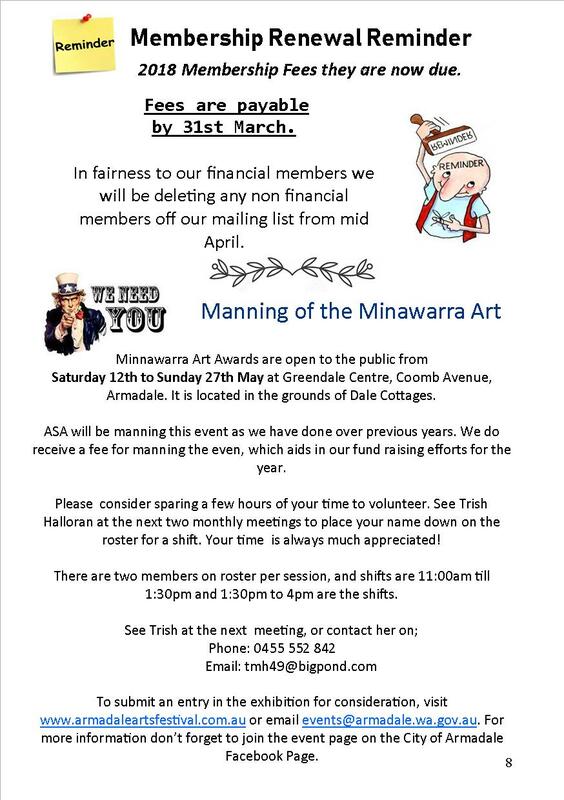 Artist entries for the City of Armadale’s Minnawarra Art Awards will open in early February, with the exhibition presented 12-27 May 2018 The Art Awards will once again be presented alongside the Armadale Arts Festival 12-27 May. Works will be skillfully selected and curated by Ron Nyisztor of Nyisztor Studio, with the exhibition showcasing an enticing group exhibition, featuring a number of works across a range of mediums and an exciting public program featuring workshops, floor talks and indulgent high teas. 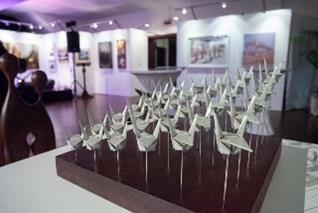 To submit an entry for consideration, visit www.armadaleartsfestival.com.au or email [email protected]. For more information don’t forget to join the event page on the City of Armadale Facebook Page. 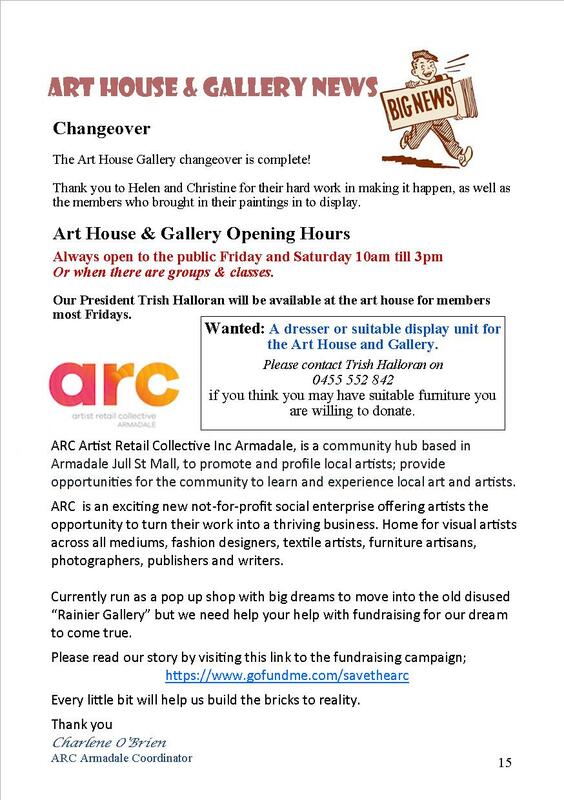 Hi everyone, there are new exciting workshops organised at the Art House, please click HERE for more information. 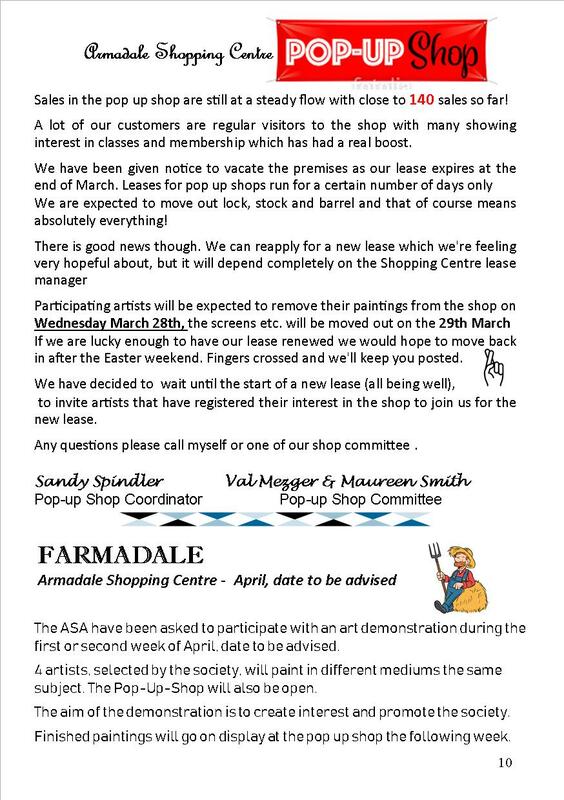 A huge amount of sales have already been made and thanks to the management and staff of ARMADALE SHOPPING CITY, we are continuing for a while yet. Fresh artwork is being hung constantly so please keep coming back to have another look. Its well worth it, a wonderful oportunity to pick up a lovely piece of original, and local, artwork at extremely reasonable prices.